Objective: The objective of this study is to evaluate the the reliability of magnetic resonance imaging (MRI) in diagnosing alar ligament disruption in patients with potential atlanto-occipital dissociation (AOD). Materials and Methods: Three-blinded readers performed retrospective review on 6 patients with intra-operative confirmed atlanto-occipital dissocation in addition to a comparison cohort of patients with other cervical injuries that did not involve the atlanto-occipital articulation. Ligament integrity was graded from 1 to 3 as described by Krakenes et al. The right and left ligaments were assessed separately. Inter-observer agreement by patient, by group (AOD vs. non-AOD), and intra-observer agreement was calculated using weighted Cohen's kappa. Results: Interobserver agreement of alar ligament grade for individual patients ranged from slight to fair (κ = 0.05–0.30). Interobserver agreement of alar ligament grade for each group (AOD vs. non-AOD) ranged from fair to substantial (κ = 0.37–0.66). No statistically significant difference in categorical analysis of groups (AOD vs. non-AOD) and grade (0–1 vs. 2–3) was observed. Intraobserver agreement of individual patient's alar ligament grade ranged from moderate to substantial (κ = 0.50–0.62). Conclusion: The use of MRI to detect upper cervical ligament injuries in AOD is imperfect. Our results show inconsistent and unsatisfactory interobserver and intraobserver reliability in evaluation of alar ligament injuries. While MRI has immense potential for detection of ligamentous injury at the craniovertebral junction, standardized algorithms for its use and interpretation need to be developed. Atlanto-occipital dissociation (AOD) is a rare but devastating injury that accounts for 6%–8% of all traffic fatalities.,, The prognosis of AOD has been shown to directly correlate with the timing of initial diagnosis., At a major trauma center in the United States, all patients diagnosed with AOD on initial evaluation survived without delayed neurologic dysfunction; whereas, delayed diagnosis correlated with an 89% death rate within 90 days of injury. Despite standardized trauma evaluation protocols, clinical and radiographic diagnosis of AOD remains challenging. In recent decades, computed tomography (CT) has supplanted the use of cervical radiographs in the setting of acute cervical trauma. Past work has demonstrated 99% identification of relevant anatomic landmarks with CT in comparison to only 39%–84% with lateral radiographs. Nonetheless, craniometric measurements, such as Powers ratio, basion–dens interval, basion–axial interval and condyle-C1 interval (CCI), continue to show poor sensitivity in diagnosing AOD regardless of imaging modality,,,,,,, with approximately 25% not diagnosed with CT scans. MRI evaluation is popular due to the ability to directly visualize soft-tissue injuries whereas CT and radiographs rely on craniometric measurements as a predictor of occipitocervical stability, MRI has the advantage of high soft-tissue contrast and multi-planar imaging capabilities. To date, MRI is used in diagnosis and treatment algorithms for AOD, however, little data exist in regards to its validity. Critical to diagnosing subtle cases of AOD is the integrity of the alar ligaments which have been described as perhaps the main stabilizer of the occipitocervical junction. The current study was designed to evaluate the reliability of MRI in diagnosing alar ligament disruption in patients with potential AOD. Following Institutional Review Board approval, patients with acute AOD from a single institution from 2008 to 2016 were identified using International Classification of Diseases (ICD)-9 and ICD-10 coding. The study population consisted of patients with acute AOD diagnosed with routine imagining including MRI and confirmed intraoperatively. A cohort of an equal number of patients was created that consisted of other upper cervical injuries that did not include the atlanto-occipital articulation. Patient' demographics, including age and mechanism of injury, were recorded for all patients with acute AOD. AOD was defined as widening of the atlanto-occipital articulation of greater than 4 mm on CT imaging with instability noted on intraoperative physical examination as defined by Bellabarba et al. 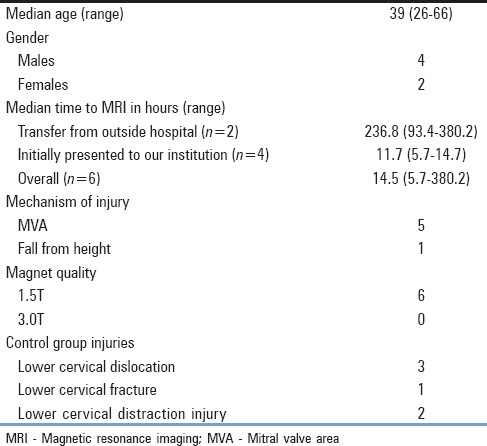 Patients with AOD with preoperative cervical MRI were included in the study. Patients with suspected AOD but without documented instability noted on intraoperative examination or without preoperative cervical MRI were excluded from the study. Three independent observers, consisting of two attending orthopedic spine surgeons and one musculoskeletal radiologist, read the preoperative MR imaging specifically to assess the integrity of the alar ligaments. Each observer was blinded to the patient's diagnosis and to the other observer reads. Each reviewer independently read the MRIs on two separate occasions with at least 1 month in between reads. All MRIs included sagittal, coronal, and axial T1 and T2 weight images as well as sagittal STIR images. MRIs were obtained using both 1.5 and 3 Tesla magnets. Ligament integrity was graded using the Krakenes et al. scale with low signal strength denoting uninjured ligaments., The grading scheme was 0 = low-signal strength throughout, 1 = high signal strength in <1/3 of ligament cross section, 2 = high-signal strength from 1/3 to 2/3 of ligament cross-section, and 3 = high-signal strength in >2/3 of ligament cross-section. The right and left ligaments were assessed separately. 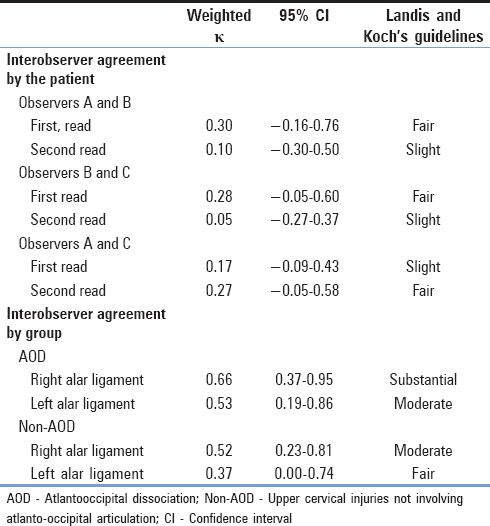 Interobserver agreement by patient and by group (AOD vs. non-AOD) and intra-observer agreement by patient and by group (AOD vs. non-AOD) was calculated using weighted Cohen's kappa, and degree of agreement was categorized using Landis and Koch's classification: <0: no agreement, 0–0.20: slight, 0.21–0.40: fair, 0.41–0.60: moderate, 0.61–0.80: substantial, and 0.81–1: almost perfect agreement. Chi-square and Fisher's exact tests were used for statistical comparisons between the AOD vs. non-AOD groups and Grade 0–1 ligament vs. Grade 2–3 ligament. All statistical analyses were performed in SAS 9.4 (SAS Institute, Inc., Cary, NC, USA) and level of significance (two-sided) was set at 0.05. Eight patients with acute AOD were identified with six patients met the inclusion and exclusion criteria. Six patients with upper cervical injuries not involving the occipitocervical articulation were used as a control group [Table 1]. Mechanism of injury of the AOD group included MVA (5 patients) and fall from height (1 patient). No cases of low energy acute AOD were observed. 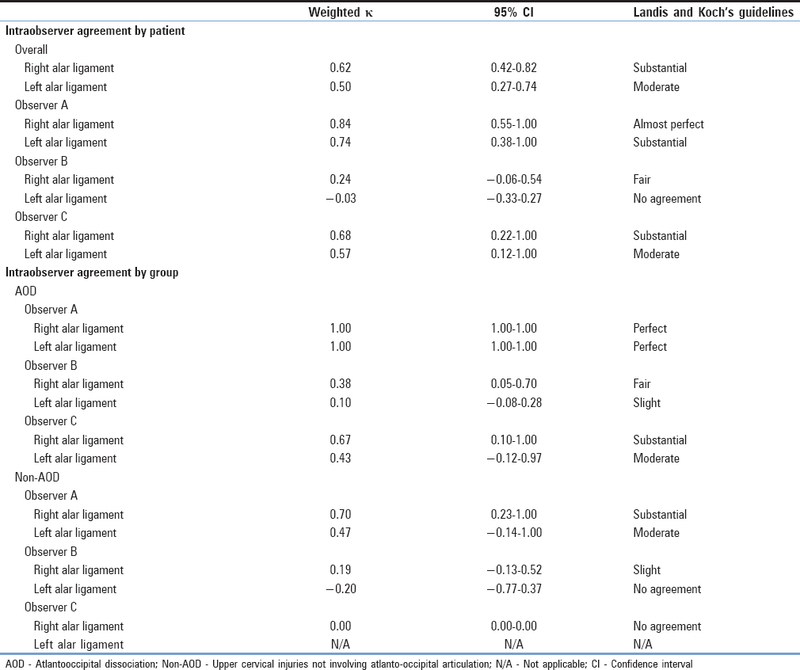 The weighted kappas, 95% confidence intervals, and agreement classifications for interobserver agreement by patient, interobserver agreement by group (AOD vs. non-AOD), and intra-observer agreement by patient can be shown in [Table 2] and [Table 3]. Interobserver agreement of alar ligament grade for individual patients ranged from slight to fair (weighted kappa range: 0.05–0.30). Interobserver agreement of alar ligament grade for each group (AOD vs. non-AOD) ranged from fair to substantial (weighted kappa range: 0.37–0.66). Intraobserver agreement of individual patient's alar ligament grade ranged from moderate to substantial (weighted kappa range: 0.50–0.62). Intraobserver agreement of alar ligament grade for each group (AOD vs. non-AOD) ranged from no agreement to perfect agreement (weighted kappa range: −0.20–1.00). Although each observer graded more ligaments 2–3 in the AOD than the non-AOD group for both reads, no statistically significant difference in categorical analysis of groups (AOD vs. non-AOD) and grade (0–1 vs. 2–3) was observed, regardless of individual observer or read (Fisher's exact test range: 0.07 ≤ P ≤ 0.84). Despite the widespread use of MRI in cervical spine trauma, its validity has not been verified. To date, current cervical guidelines lack sufficient evidence to support MRIs use in evaluating injuries to the craniovertebral junction.,, In the current study, we found limitations in the use of MRI in evaluating alar ligament injury in patients with acute, traumatic atlanto-occpital injuries. Our results suggest that MRI evaluation of the alar ligaments has unsatisfactory inter and intra-observer reliability which significantly limits its usefulness in diagnosing atlanto-occipital injuries. To the author's knowledge, this is the first study to evaluate the reliability of MRI in diagnosing AOD in adults. Prior research in normal adults and patients with whiplash has established MRI as an effective tool in visualizing the ligamentous complex of the cranioverterbral junction., In 2006, Bellabarba et al. published a treatment algorithm of AOD that based stability on the integrity of the craniovertebral ligament as judged by MRI. They concluded that unilateral disruptions or sprains to the alar ligaments represent stable injuries that can be adequately treated non-operatively; whereas, disruption of the alar ligaments or other craniocervical stabilizers indicates a clinically unstable injury that requires surgical treatment. In the current study, interobserver agreement of alar ligament grades for individual patients ranged from slight to fair-depending on laterality (weighted kappa range: 0.05–0.30). Our result of inconsistencies in rating the degree of injury to the alar ligaments is not unlike past studies by Krakens, Roy, Kaale and Schmidt.,,, Pfirrman et al. demonstrated structural alterations in the alar ligaments including asymmetry in up to 58% and fluid detected in 8% in asymptomatic individuals. In evaluating patients with whiplash, Bitterling et al. concluded that MRI signal differences in the alar ligaments could not be differentiated from normal variants. In the current study, there was a trend for patients with AOD to have higher alar ligament grades (2–3) in comparison to the non-AOD group; however, this did not meet statistical significance (0.07 ≤ P ≤ 0.84). In addition on reviewer reevaluation, intraobserver agreement was unacceptably low (kappa 0.50–0.62). These results suggest that MRI is not a reliable tool in evaluating injury to the alar ligaments. Furthermore, the authors advocate that abnormal MRI signal of the alar ligaments does not readily correlate with clinical stability and thus caution is advised when abnormal findings are encountered on MRI. Due to the strict diagnostic inclusion criteria and the rarity of the condition, this study's primary limitation is its small sample size. In addition, while the alar ligament grading scale utilized in this study developed by Krakenes et al. was described utilizing a 1.5-T MRI magnet, the current study utilized MRI studies with both 1.5-T and 3-T magnetic qualities; however, all patients in the AOD cohort underwent MRI with a 1.5-T magnet. This potentially serves as a source of study bias as recent work by Schmidt et al. has shown improved visualization of the alar ligaments utilizing a 3-T magnet in comparison to 1.5-T magnet in normal, healthy patients. Our study shows that the use of MRI to detect upper cervical ligament injuries in AOD is imperfect. We found inconsistent and unsatisfactory interobserver and intraobserver reliability in evaluation of alar ligament injuries. While MRI has immense potential for the detection of ligamentous injury at the craniovertebral junction, standardized algorithms for its use and interpretation need to be developed. Adams VI. Neck injuries: I. Occipitoatlantal dislocation – A pathologic study of twelve traffic fatalities. J Forensic Sci 1992;37:556-64. Alker GJ Jr., Oh YS, Leslie EV. High cervical spine and craniocervical junction injuries in fatal traffic accidents: A radiological study. Orthop Clin North Am 1978;9:1003-10. Bucholz RW, Burkhead WZ. The pathological anatomy of fatal atlanto-occipital dislocations. J Bone Joint Surg Am 1979;61:248-50. Mendenhall SK, Sivaganesan A, Mistry A, Sivasubramaniam P, McGirt MJ, Devin CJ, et al. Traumatic atlantooccipital dislocation: Comprehensive assessment of mortality, neurologic improvement, and patient-reported outcomes at a level 1 trauma center over 15 years. Spine J 2015;15:2385-95. Bellabarba C, Mirza SK, West GA, Mann FA, Dailey AT, Newell DW, et al. Diagnosis and treatment of craniocervical dislocation in a series of 17 consecutive survivors during an 8-year period. J Neurosurg Spine 2006;4:429-40. Tan J, Liao G, Liu S. Evaluation of occipitocervical neutral position using lateral radiographs. J Orthop Surg Res 2014;9:87. Barba CA, Taggert J, Morgan AS, Guerra J, Bernstein B, Lorenzo M, et al. Anew cervical spine clearance protocol using computed tomography. J Trauma 2001;51:652-6. Dziurzynski K, Anderson PA, Bean DB, Choi J, Leverson GE, Marin RL, et al. Ablinded assessment of radiographic criteria for atlanto-occipital dislocation. Spine (Phila Pa 1976) 2005;30:1427-32. Horn EM, Feiz-Erfan I, Lekovic GP, Dickman CA, Sonntag VK, Theodore N, et al. Survivors of occipitoatlantal dislocation injuries: Imaging and clinical correlates. J Neurosurg Spine 2007;6:113-20. Dickman CA, Papadopoulos SM, Sonntag VK, Spetzler RF, Rekate HL, Drabier J, et al. Traumatic occipitoatlantal dislocations. J Spinal Disord 1993;6:300-13. Harris JH Jr., Carson GC, Wagner LK, Kerr N. Radiologic diagnosis of traumatic occipitovertebral dissociation: 2. Comparison of three methods of detecting occipitovertebral relationships on lateral radiographs of supine subjects. AJR Am J Roentgenol 1994;162:887-92. Hadley MN, Walters BC, Grabb PA, Oyesiku NM, Przybylski GJ, Resnick DK, et al. Diagnosis and management of traumatic atlanto-occipital dislocation injuries. Neurosurgery 2002;50:S105-13. Dahdaleh NS, Khanna R, Menezes AH, Smith ZA, Viljoen SV, Koski TR, et al. The application of the revised condyle-C1 interval method to diagnose traumatic atlanto-occipital dissociation in adults. Global Spine J 2016;6:529-34. Radcliff KE, Ben-Galim P, Dreiangel N, Martin SB, Reitman CA, Lin JN, et al. Comprehensive computed tomography assessment of the upper cervical anatomy: What is normal? Spine J 2010;10:219-29. Gire JD, Roberto RF, Bobinski M, Klineberg EO, Durbin-Johnson B. The utility and accuracy of computed tomography in the diagnosis of occipitocervical dissociation. Spine J 2013;13:510-9. Schoenfeld AJ, Tobert DG, Le HV, Leonard DA, Yau AL, Rajan P, et al. Utility of adding magnetic resonance imaging to computed tomography alone in the evaluation of cervical spine injury: A propensity-matched analysis. Spine (Phila Pa 1976) 2018;43:179-84. Willauschus WG, Kladny B, Beyer WF, Glückert K, Arnold H, Scheithauer R, et al. Lesions of the alar ligaments.In vivo and in vitro studies with magnetic resonance imaging. Spine (Phila Pa 1976) 1995;20:2493-8. Krakenes J, Kaale BR, Moen G, Nordli H, Gilhus NE, Rorvik J, et al. MRI assessment of the alar ligaments in the late stage of whiplash injury – A study of structural abnormalities and observer agreement. Neuroradiology 2002;44:617-24. Krakenes J, Kaale BR. Magnetic resonance imaging assessment of craniovertebral ligaments and membranes after whiplash trauma. Spine (Phila Pa 1976) 2006;31:2820-6. Yüksel KZ, Yüksel M, Gonzalez LF, Baek S, Heiserman JE, Sonntag VK, et al. Occipitocervical vertical distraction injuries: Anatomical biomechanical, and 3-tesla magnetic resonance imaging investigation. Spine (Phila Pa 1976) 2008;33:2066-73. Schmidt P, Mayer TE, Drescher R. Delineation of alar ligament morphology: Comparison of magnetic resonance imaging at 1.5 and 3 tesla. Orthopedics 2012;35:e1635-9. Radcliff KE, Hussain MM, Moldavsky M, Klocke N, Vaccaro AR, Albert TJ, et al. In vitro biomechanics of the craniocervical junction-a sequential sectioning of its stabilizing structures. Spine J 2015;15:1618-28. Panjabi M, Dvorak J, Crisco J 3rd, Oda T, Hilibrand A, Grob D, et al. Flexion, extension, and lateral bending of the upper cervical spine in response to alar ligament transections. J Spinal Disord 1991;4:157-67. Panjabi M, Dvorak J, Crisco JJ 3rd, Oda T, Wang P, Grob D, et al. Effects of alar ligament transection on upper cervical spine rotation. J Orthop Res 1991;9:584-93. Panjabi MM, Dvorák J, Crisco J, Oda T, Grob D. Instability in injury of the alar ligament. A biomechanical model. Orthopade 1991;20:112-20. Ryken TC, Aarabi B, Dhall SS, Gelb DE, Hurlbert RJ, Rozzelle CJ, et al. Management of isolated fractures of the atlas in adults. Neurosurgery 2013;72 Suppl 2:127-31. Ryken TC, Hadley MN, Aarabi B, Dhall SS, Gelb DE, Hurlbert RJ, et al. Management of acute combination fractures of the atlas and axis in adults. Neurosurgery 2013;72 Suppl 2:151-8. Ryken TC, Hadley MN, Aarabi B, Dhall SS, Gelb DE, Hurlbert RJ, et al. Management of isolated fractures of the axis in adults. Neurosurgery 2013;72 Suppl 2:132-50. Kim HJ, Jun BY, Kim WH, Cho YK, Lim MK, Suh CH, et al. MR imaging of the alar ligament: Morphologic changes during axial rotation of the head in asymptomatic young adults. Skeletal Radiol 2002;31:637-42. Roy S, Hol PK, Laerum LT, Tillung T. Pitfalls of magnetic resonance imaging of alar ligament. Neuroradiology 2004;46:392-8. Kaale BR, Krakenes J, Albrektsen G, Wester K. Clinical assessment techniques for detecting ligament and membrane injuries in the upper cervical spine region – A comparison with MRI results. Man Ther 2008;13:397-403. Pfirrmann CW, Binkert CA, Zanetti M, Boos N, Hodler J. MR morphology of alar ligaments and occipitoatlantoaxial joints: Study in 50 asymptomatic subjects. Radiology 2001;218:133-7. Bitterling H, Stäbler A, Brückmann H. Mystery of alar ligament rupture: Value of MRI in whiplash injuries – Biomechanical, anatomical and clinical studies. Rofo 2007;179:1127-36.